Meet Meagan Burns, who raises Limousin cattle on 630 acres in San Miguel de Allende, Mexico. 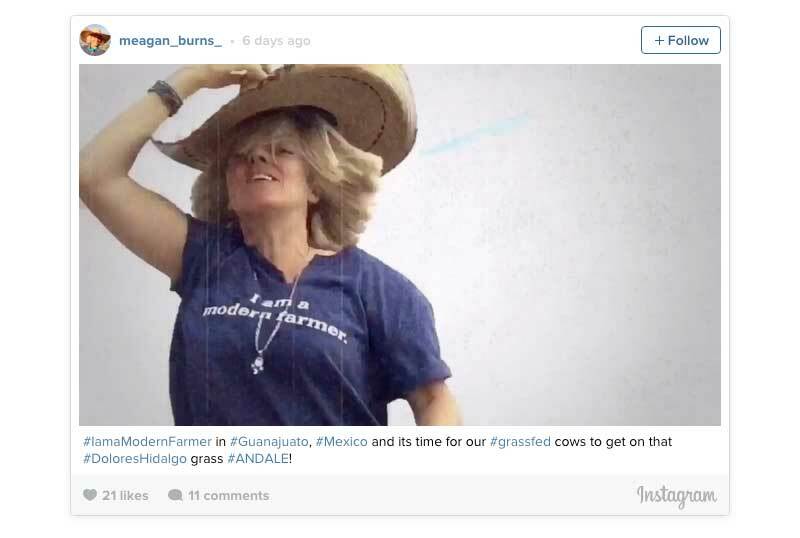 She ended up in San Miguel de Allende, Mexico, where her ex-husband, Reed Burns, had spent a “decade cleaning up a handsome breed of Limousin cattle.” When she learned he had plans to sell the cattle to a factory farm in Northern Mexico, she stepped in, proclaiming that they needed grass-fed beef in their area. Rancho Santo Niño, located near Dolores Hidalgo, in the central Mexican state of Guanajuato, is home to about 70 head of cattle that graze on 630 acres. Burns says they may also build greenhouses in the future. Meagan Burns: I want to be very clear that while I am working on and for our ranch to produce grass-fed beef by using the most optimal practices possible, I by no means classify myself as a farmer. I believe that title belongs to the hard-working individuals who are working the land and livestock from dawn to dusk, and everything in between. I have great regard for the cattle ranchers I read about and learn from, which includes the Mexican family that lives on Rancho Santo Niño, as well as the butchers of Dolores Hidalgo who let me work alongside them. As luck would have it, I found myself in a livestock situation that needed managing, marketing, and dedication; I just so happen to have these attributes, plus an unwavering regard for cows. It feels good to be among them; I love their sturdy nature and long deep stares. I suppose the modern part is that I practice reiki on the cows and play my crystal bowls for them. The guys look at me like I’m absolutely bananas, but I think the cows enjoy it tremendously. MB: I have expressed my profound love for cows and have been met with, “if you love them, how can you kill them?” This is certainly a valid point. I was a vegetarian for years, so I get it. An autoimmune condition sent me back to eating meat and my health improved greatly as my interest turned to the cows outside my window. Our cows are not pets and they have their purpose; setting them free is not an option, as some have suggested. Temple Grandin inspired me to want to treat them with the utmost respect and give them a good life until it is time for them to become fuel for people. I know where my food comes from when I sit down at the table. It is a deeply profound experience and has required me to become a better person. I would love for more people to have the experience of knowing where their food comes from. MB: Cows. Cows. Cows. Because cows. MB: A few years ago, while still living in Chicago, I proclaimed I wanted to be a Modern Farmer, yet I could not keep a house plant alive, nor did I own a dollop of dirt. I scoffed at my dreams and forgot them as best I could, yet life led me to the cows of Rancho Santo Niño. I’m not presumptuous enough to give out modern farming advice, but I will suggest listening to your heart; the heart knows. #IamaModernFarmer in #Guanajuato, #Mexico and its time for our #grassfed cows to get on that #DoloresHidalgo grass #ANDALE! Want a chance at an interview with Modern Farmer and other cool prizes? Just post a picture or a video on Twitter and/or Instagram with the hashtag #iamamodernfarmer and you’ll be entered for a chance to win. Every week, we’ll choose one winner to be profiled onModernFarmer.com. Every month, one of the weekly winners will be picked to win $100 inModern Farmer swag. One of the monthly winners will also win the grand prize: A VIP trip for two to the Farm Aid 2016 concert!